FLASH BACK TO THE PAST 1: The class 8DW 1219 newly plinthed at Kempton Park Stn - Image taken 15.9.1973 (c) George Woods. This entry is in memory of the locomotive which was once (1973) plinthed at the Kempton Park Station. Today (2013) 40 years later it may be found in a sorry state on a farm (Van der Merwe) near Rayton. Follow the link. Somehow the locomotive got unplinthed - For many years she was stored at the REEFSTEAMERS shed in Germiston. John Middleton's guide lists the locomotive as a former THF "loan" locomotive. Perhaps someone can explain how it came that REEFSTEAMERS let go of her and when and under which arrangement she got to be sent to Van der Merwe farm? 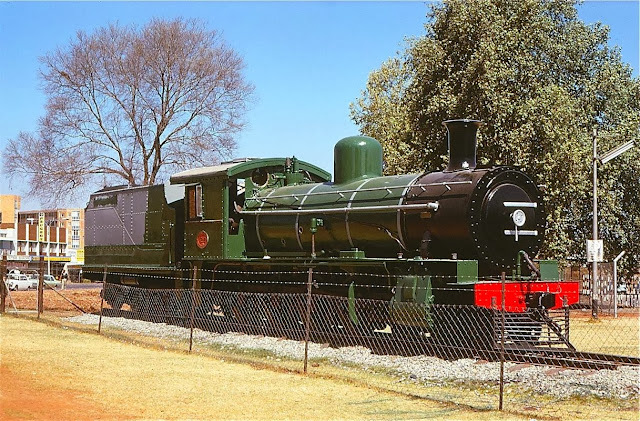 Quoting from Paxton & Bourne: The Cape Government Railway's (CGR) 8th class was conceived as a mixed-traffic locomotive equally suitable for goods and passenger work. They were designed by H.M. Beatty and had larger driving wheels than the 7th class. Beatty added a bogie to the front to improve the ride. The first order for the CGR consisted of 23 locomotives delivered by Neilson, Reid and Coin 1902 and 1903 and were placed in service throughout the Colony. In 1910 they became the SAR class 8. The CGR's 2nd order of the 8th class was delivered in 1903 by Neilson, Reid and Co and the North British Locomotive Co. These 38 engines differed only slightly from the original order, and were later classified as Class 8D on the SAR. Origin of Class "8DW": During A.G. Watson's term as chief mechanical engineer, many of the classes 8 - 8F were fitted with superheated boilers and either inside or outside admission piston valves. The classification of the inside admission was indicated with the suffix "W" while the outside admission engines retained their old classification. They were a fine class of engine and saw service on every system of the SAR, becoming the mainstay of motive power on many branch lines in the 1920s. They ended their days on the shunting service until 1972, when all were withdrawn. 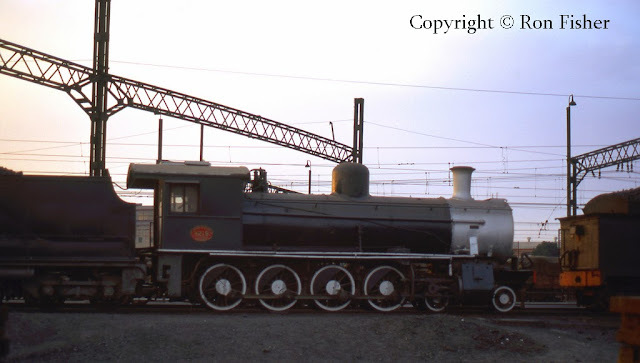 FLASH BACK TO THE PAST 2: 1972-08-19: Amongst the locomotives withdrawn from service and stored at Germiston shed was this 8DW class 4-8-0 1219. It was built by Neilson, Reid and Co of Glasgow in Scotland in 1903 as the Cape Government Railways 8th class image (c) Ron Fisher [ sourced from: http://www.flickr.com/photos/train-pix/5733595084/] Note that some of the motion was already missing in 1972. Shortly after this image was taken, the locomotive was plinthed (see image at the top) for a period at Kempton Park station.